My Essential Ventures: How I Deal With The Holidays As An Introvert! First, let me clear up what an introvert is. The difference between an introvert and an extrovert is how we recharge. I recharge by being alone and not being around a big group of people. Extroverts recharge by being around people and a lively uptick atmosphere. At least this is true for my husband, the extrovert, and I, the introvert. Big groups of people for me are sometimes overwhelming and exhausting. 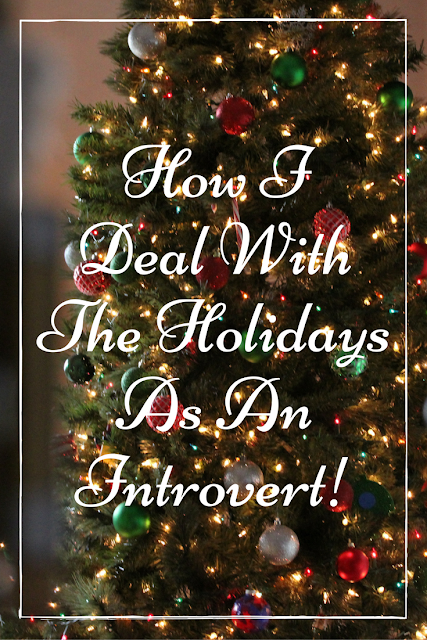 Now that you know what my definition of an introvert is let me tell you my holiday schedule. It all starts with Thanksgiving, we host it at my house. Usually, it's a small gathering not too bad. Then I go Black Friday Shopping. 8 Tips For a Succesful Black Friday Trip here. I consider Black Friday super fun, but it takes me the whole weekend to recover. The first or second weekend in December is my daughters birthday party. Then there is going up to my moms for a weekend in December. Then whatever Christmas parties are in between. Then we have 4 family Christmas parties to attend on Christmas Eve and Christmas Day. Just writing that out makes me overwhelmed. So how do I manage? Schedule a massage. Sometimes with a new massage therapist. I've known my therapist since I was 19 and we are really good friends, so it's hard for us not to chat the whole massage. So going to someone new could help the temptation to talk the whole time. To be honest my answer to everything is to get a massage. Read. During this time a year, I take the time to read every night. It's alone time. I also use the excuse that I need to wrap presents. This means being in my room behind a locked door, it's blissful. My husband hates wrapping, so it's perfect. I know it's kind of cliche to say but take one day at a time. Sometimes I have to break it down to one event at a time. Plan and be organized. It's even worse if you are frazzled because of last minute stuff to do before an event. Say no to some parties. There are a few parties that my husband and kids go to that I don't. My husband is pretty understanding about how much I can handle. I also don't volunteer at the school this month. I plan a day where I don't leave the house or get out of my PJs. I will be super lazy and just spend the day with my family no one else. We watch movies, we eat snacks, leftovers, microwave meals, whatever is super easy. I take this day and I am off. It's a struggle to be an introvert during the holidays because there are so many events and parties. If I'm not careful to schedule some down time I become overwhelmed and grumpy and nobody wants to be around me. I do love the holidays. It's the only time of year that I get to see some family. I love sharing food and catching up with people. Going and making cookies at Gramma's house with my kids. Winter break from school. It is a fun time of year, but it can be overwhelming.